Is video part of your social media marketing mix? Looking for tips to get started with video? 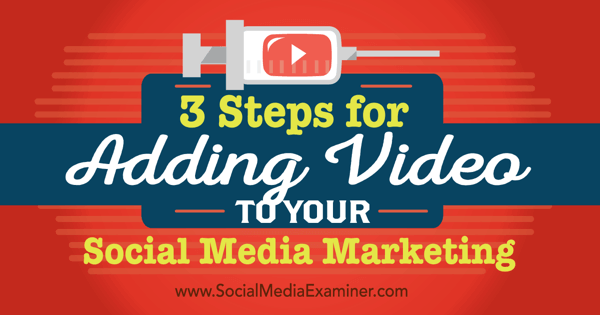 Making the right decisions in three key areas will help you create videos that engage people. 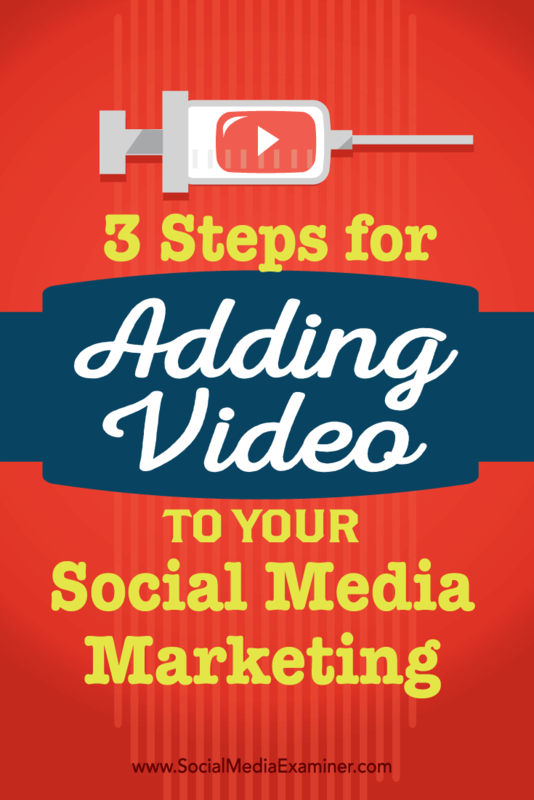 In this article you’ll discover three steps to add video to your social media marketing. Discover how to add video to your social media marketing. The great thing about social media is that you can create many different types of videos to keep your publishing schedule interesting and your followers engaged. Eighty-eight percent of businesses say that video is an important part of their marketing strategy. However, the biggest struggles are to stop recycling old content and choose the right type of video content. Here are five ways that you can include video in your social media marketing. Pre-roll video ads are short 15- to 30-second videos that grab the viewer’s interest in a product or service. You can use them on social media sites such as YouTube, Facebook, Twitter and Instagram. The secret to a successful pre-roll video is to gain the viewer’s attention quickly, as most people naturally gravitate towards the Skip button or scroll past videos on their news feed. One way to produce highly targeted content is to teach your audience how to do something. This helps you improve shares and attract new followers. Fitness trainer Kayla Itsines regularly produces videos that teach her target audience how to do various fitness moves. Content like this has helped her become an influencer in the fitness industry, gaining her 4.4 million followers on Instagram. Her videos are easy to follow and they feature content that people would normally expect to pay money to see. “How to” video searches on YouTube are up to 70%, with over 100 million hours watched on the platform. Problem-solving content is valuable and video is one of the best ways to offer it. Marketers are always hoping to create the next viral video, but with so much competition, it’s not as easy as it sounds. That’s why it’s important to take advantage of the trending topics across social platforms. The Trending Topics sections on both Twitter and Facebook are popular sources of news content for social users. If you create a video related to a trending topic, you can potentially tap into a huge market. Jimmy Fallon created an a cappella video to celebrate the new Star Wars movie. Creating content around a popular event helped this video to secure millions of shares across social media. Take a look at the events likely to create a buzz during the calendar year and incorporate these into your video marketing strategy. Showing people what goes on behind the scenes at your company is a great way to connect with your audience on a personal level. It helps close the gap between brand and customer, which is important in the world of marketing. In this video, Ben and Jerry’s introduces one of their Flavor Gurus and gives viewers a brief look at what goes into creating their products and what it’s like to work for the company. When it comes to video content, 76% of consumers say that they would share a video if it’s entertaining. When you incorporate a product video into your social strategy, it’s important to strike a balance between promoting your product and keeping the tone light, fun and informal. This Oreo video is an example of a successful product video. It’s a short animated clip that features Oreo S’mores-flavored cookies. The video works well because Oreo was able to tell a short, engaging story that introduces the product without being overly promotional. With the explosive growth in video marketing in the past five years, it’s hardly surprising that social networks have made it easy to upload and create video from within their platforms. For example, you can use the apps for Instagram, Vine and Twitter to shoot, edit and upload footage with very little effort. This is a great option if you don’t have a large video budget. If you have some video experience, you can use various software applications to create your videos. Adobe After Effects is an industry-leading tool that helps you create motion graphics, and it costs around $30 per month. Also consider free tools like PowToon and Camtasia to create video footage. If you want a slick, professional product, it’s best to leave that to the video marketing experts. Depending on which company you use, prices can range from $1,000 to $20,000, and this typically includes scriptwriting, storyboarding, voiceover and editing. Although you can create videos within social media apps, using a video hosting platform will allow you to measure the videos’ success. You can upload videos for free to YouTube and gain insights including views and shares. If you want to delve deeper into the performance of your videos, consider signing up for a paid account on Wistia or Vimeo. You can use their analytics to drill down into metrics like play rate, how long people are watching and the type of audience you’re attracting. Once you have this data on hand, you can use it to tweak and improve your future video marketing efforts. When it comes to creating videos for your social media channels, the better-performing videos typically are short, engaging and relevant to what your audience really cares about. What do you think? Have you tried any of these tactics in your social media video marketing? Have your efforts been successful? What tips do you have to share? I’d love to hear more in the comments below! Tips for adding video to your social media marketing. Sarah is a content marketer at Wyzowl and Publi.sh. Wyzowl create explainer videos, infographics, ebooks and blog content, and Publi.sh is a free community to share and download marketing ebooks.